Food insecurity is a worrying challenge worldwide, with sub-Sahara Africa most affected. Literature reveals that in developing countries, food insecurity is a largely ‘‘managed process’’, meaning people are active participants in responding to the risks they face in life. This paper focuses on how households cope with food shortages and how these food coping strategies vary along the urban–rural continuum. A transect approach was used to guide data collection in and around the city of Tamale in northern Ghana. A total of 19 Focus Group discussions, having eight participants each (four women, four men), were conducted between March and May 2014. Additionally, three qualitative in-depth interviews were also conducted, one each in the urban, periurban and rural area. In periurban and rural areas, gathering of wild food and selling of charcoal was widely practised, while in urban areas, most households tended to reduce the number of meals as a more frequent coping strategy. The study identified five coping strategies along the urban–rural continuum as the most severe in times of food insecurity, namely skipping a whole day without food, borrowing, buying food on credit, consuming seed stock and restricting adult intake in favour of children. Hunting, consuming less preferred food, taking occasional jobs and engaging in small trading were considered as not severe. Study results reveal that food coping strategies vary from one spatial entity to another in terms of frequency, severity and coping strategy indices along the urban–rural continuum. This information is useful for indicators to predict crisis (early warning), to understand shortfalls in access to adequate food (assessment), to allocate resources (targeting) or to track the impact of interventions (monitoring and evaluation). Food insecurity and undernourishment have persisted in the developing world despite overall progress made globally, with sub-Saharan Africa showing limited progress in recent years, in the remaining regions with the highest prevalence of undernourishment . Around one in eight people in the world in 2011–13 was estimated to regularly not getting enough food to conduct an active life (chronic hunger) . Food insecurity is defined as “limited or uncertain availability of nutritionally adequate and safe foods or limited or uncertain ability to acquire acceptable foods in socially acceptable ways” . According to FAO, IFAD and WFP (2013:50) , “Food security is a situation that exists when all people, at all times, have physical, social and economic access to sufficient, safe and nutritious food that meets their dietary needs and food preferences for an active and healthy life”. The main pillars of this definition are stability (adequate resources to get food in sufficient quantity), stable access (to have food at all times) and utilization (adequate diet, sanitation and health care for nutritional well-being). Problems of food insecurity and poverty have been mostly reported in rural areas, and most of the international development focus was directed on rural farming in the past. Nevertheless, research results from studies in Africa show its occurrence in and around cities [4, 5]. The growing evidence of food insecurity in and around cities and an estimated exponential growth of population in African cities, projected to rise from 11.3 % in 2010 to a 20.2 % by 2050 , calls for a critical analysis of potential challenges concerning urban dwellers and how this population would cope with these challenges. Literature reveals that in developing countries, food insecurity and hunger is largely a ‘‘managed process’’, meaning “people are not passive victims of sudden events but are active participants in responding to the risks they face in their daily lives” [7–9]. Sen  looks at starvation in relation to food availability and food entitlement. “A person’s ability to command food-indeed, to command any commodity he wishes to acquire or retain—depends on the entitlement relations that govern possession and use in that society” (Sen 1981:154) . “Individuals face starvation if their full entitlement set does not provide them with adequate food for subsistence” (Devereux 2001:246) . The notion of active responding to food shortages at household levels referred as ‘coping’ in this paper has “proven useful to operational humanitarian agencies and researchers in measuring localized food insecurity” (Maxwell et al. 2008:533) . Urban agriculture has been pointed out as one of the strategies adopted by most urban dwellers to manage the scourge of food shortages, with most produced food used for personal consumption providing a degree of food security and dietary diversity for many of the urban poor [13, 14]. Various food coping strategies have been reported in Africa varying from one region to another. In Rwanda, for example, the sale of cattle during peacetime was due to shift in assets of households. Nevertheless, during the time of genocide (1994), about half of cattle sales were driven by the need to buy food . In Nairobi, Kenya, the slum dwellers were reported to use frequently strategies related to reduction of food consumed (69 %) and credit (52 %) . In Nigeria, about 95.8 % of the entire population rely on less preferred food, while 83.5 % rely on limiting food portion at meal times . In Ghana, poor rural families rely on food remittances to cope with chronic hunger, from household members who migrate to distance agriculture-rich hinterland . In predominantly slum communities of Bolivia, Ecuador, Philippines and Thailand, women have been reported to take lead in adopting various coping strategies in times of food shortages. Women in vulnerable households, for example, were found to likely engage in food enterprises, where choice of business is associated with household vulnerability to food insecurity . Urban low-income households were reported to select enterprises that earn them money to get food for consumption as a strategy to mitigate the risk of food shortages . Although diverse food coping strategies have been adopted by different communities, cultural food beliefs and taboos sometimes detect or determine food coping strategies. These sometimes “have a significant influence on family nutritional well-being…, often related to foods of animal origin and mainly affect women and children” . In Ghana, poverty and hunger are more prevalent in the three northern regions. About 28 % of households in upper east region suffer severe or moderate food insecurity, while 10 % in northern region and 16 % in upper east region suffer the same . The poorest households in northern Ghana resort to severe coping strategies like spending the whole day without eating compared to wealthier households . Quaye (2008:334)  noted that during the months of insufficient food, households use coping mechanisms like “migration to southern Ghana for wage labour, support from relatives and friends outside the regions, sales from livestock and household valuables as well as reduction of food intake and consumption of less preferred food”. Although many studies have been conducted across sub-Saharan Africa on food coping strategies [15–18, 22, 23], little has been reported on how these strategies can vary across the urban–rural continuum, in the advert of increasing reported cases of the scourge of urban poverty and food insecurity. Variation in food coping strategies from one spatial entity to another in terms of frequency, severity and coping strategy indices can be useful indicators to predict crisis (early warning), to understand shortfalls in access to adequate food (assessment), to allocate resources (targeting) or to track the impact of interventions (monitoring and evaluation) . According to Maxwell et al. (2008:533)  “these kinds of analyses are needed to strengthen geographic targeting and the impartial allocation of assistance”. This study seeks to explore and describe the behaviour and attitude of urban, periurban and rural households that relate to food and nutrition insecurity. This paper thereby particularly focuses on food coping strategies and how these coping strategies vary along the urban–rural continuum. This study uses a descriptive qualitative approach to provide information about the behaviour, attitudes and other characteristics of households related to food insecurity along the urban–rural continuum. As Yin  pointed out that qualitative research persuade through rich description and allows strategic comparison across cases. It also helps the researcher to generate an in-depth account that will present a lively picture of the research respondents’ reality . Some of the limitations of qualitative approach are that data collection and data analysis of the material can be time consuming, thus expensive . The survey was carried out between March and May 2014 in Ghana’s northern region, covering seven districts1 in and around Tamale (Fig. 1). According to the census of 2010, Tamale metropolitan area was estimated to have a population of ca. 370,000 . Tamale has an altitude of 180 m above sea level and lies within the savannah climate of West Africa. Transects laid out radially, heading towards north, east, south and west with Tamale central market being the centre guided the data collection. The transects were 2 km wide and 70 km long. The working definitions of urban, periurban and rural areas were established based on relevant reviewed literature [29–34]. The work of Iaquinta and Drescher  strongly helped in the identification of the urban, periurban and rural areas. Therefore, the first 10 km from Tamale central market was considered to be urban, distance between 10 and 40 km periurban area and distance between 40 and 70 km rural area. We are thereby aware of the shortcomings raised by Schlesinger  of a strictly distance-based definition of these spatial entities. For the purpose of comparability and simplicity of the sampling procedure, however, we applied the thresholds as outlined above. Participants of the Focus Group Discussions (FGD) were selected randomly from a list of 240 households who participated in a purely quantitative study which was conducted along the same transects to understand the socio-spatial dynamics of household food and nutrition insecurity and the role of agricultural activities in urban and periurban settings of sub-Saharan Africa . Data on urban, periurban and rural interactions from this study were used in this paper. A total of 19 Focus Group Discussions, with eight participants each (four women, four men), were conducted along the transects (Fig. 2). The FGD took place in randomly selected places along the north–south and east–west transect, considering the three spatial dimensions of the urban, periurban and rural areas in and around Tamale. All participants were familiar with the research subject as they had previously participated in the first study. Transferring the concept of FGD to the local Dagbani culture implied some methodological constraints. Indeed, Dagbani people’s oral tradition of detailed story telling favours a FGD, whereas the concept does not quite match their conversational habits. When asking an open question to the whole group, generally the oldest man answered first. His ideas were then commented by the other men and afterwards by the women. Women only answered first when asked directly. Nevertheless, participants mostly agreed on one opinion and rarely contradicted each other. Interview languages were Dagbani and English with a translator facilitating communication. Inevitably, the language barrier implies information loss and misunderstandings which were tried to be limited as much as possible by detailed enquiry and the use of illustrations (Fig. 3). Written notes could not be used in the FGD due to the majority’s illiteracy. Average duration of each FGD was about 90 min with some discussions being extended by participants’ detailed answers and others being finished after 60 min if the interviewees had to leave because of other commitments. To triangulate the information from the FGD and deepen some aspects, three qualitative interviews were conducted, one in each spatial dimension (urban, periurban and rural). The idea was to focus on women’s perspectives and create a women-only interview situation without men setting the general opinion. Therefore, three or four women who had already participated in a FGD were asked to participate. The interviews were guided by a set of questions. The in-depth interviews were generally characterized by a familiar atmosphere as all involved persons already knew each other. Data from Focus Group Discussion were entered and processed to produce frequencies, severity levels, coping strategy indices, tables and graphs. Frequency and severity of each coping strategy were derived from quantitative data collected during the FGD as suggested in Maxwell et al. [38, 39]. Numeric values were assigned to each category to process the information in excel. When asked for the frequency (“How many days in a week do you practice…?”), participants’ answers were categorized as following: “All the time”/every-day, 7; “pretty often”/3–6 days per week, 4.5; “once in a while”/one or 2 days a week, 1.5; “hardly at all”/less than once a week, 0.5; “never”, 0 (see, Table 1). The numeric value is either the exact number of days per week on which the correspondent coping strategy was practised or the average value (e.g. 4.5 for “3–6 days per week”). 1. Rely on less preferred and less expensive food? 2. Borrow food or rely on help from a friend or relative? 3. Purchase food on credit? 8. Send children to eat with neighbours? 9. Limit portion size per meal? 10. Restrict consumption by adults in order for small children to eat? 11. Ration the money you have and buy prepared food? 12. Reduce number of meals a day? 13. Skip entire days without eating? 16. Engage in small trading? To quantify the severity, numbers from 1 to 4 were assigned to each of the four categories starting with 1 “not severe”, 2 “moderate”, 3 “severe” and ending with 4 “very severe”. After quantifying frequency and severity, the coping strategy index (CSI) was calculated by multiplying both values for each location. First, a score for each single strategy in each location was produced by multiplying the frequency and severity values. All the scores were then summed up to form the CSI for that specific location, see example in Table 1. Comparison of relative severity of different location can be useful for geographic targeting or resource allocation . The coping strategies index (CSI) counts and weighs coping behaviour at the household level and has been developed as a context-specific indicator of food insecurity . As increasing frequency and severity are both represented by increasing values, a high CSI consequently portrays a serious situation of food insecurity. This situation is marked by the frequent application of coping strategies that are perceived as severe or very severe. In contrast, a low CSI stands for little dependence on severe coping strategies and thus more food secure. However, it needs to be pointed out that the index rather provides a relative measurement than an absolute assessment of the food security situation of the communities. We obtained informed consent from each participant. Permission was sought from participants of Focus Group Discussion and in-depth interviews as well as community leaders where Focus Group Discussions took place along the transects. Both participants of Focus Group Discussion and in-depth interviews had option to stop participating in the discussion or interviews at any time of their choice. None of the participants opted out of the interviews and discussions during this study. This study is part of work already published under the same ethical considerations—http://www.ajfand.net/Volume15/No4/Takemore15530.pdf. This study was approved by the ethics committee of Department of Community Nutrition, School of Medicine and Health Sciences, University for Development Studies in Ghana. The results represent the findings of Focus Group Discussions and in-depth interviews conducted between March and May 2014 in and around Tamale, Northern Region of Ghana. The majority of households experienced a poor harvest in the previous growing season, and they were consequently expecting to experience food insecurity in the current season. All interviewees explained that the most difficult time in terms of food insecurity were the months of June and July. This is the period when the rainy season has already started and people are engaged in farming, but crops not yet mature. The results of the study reveal that the frequency of some coping strategies was varying from one place to another (Fig. 4). Figure 5 shows the six most common coping strategies used in urban, periurban and rural. Borrowing, purchasing food on credit, consumption of seed stock, sending children to eat with neighbours, trading and skipping whole days without food are most frequent in the urban area (Fig. 4). Purchasing food on credit was more common for urban areas than for the periurban or rural area. One explanation is that many people in urban areas have some source of financial income through trading or jobs so traders are more likely to allow a credit. Borrowing and sending children to eat with neighbours was practised in urban areas but is often tabooed in rural areas where traditional rules still play an important role. People in urban areas tend to consume seed stock more frequently in times of need than rural households. This is explained by the fact that rural households worry about how they could afford to buy new seeds if they consumed them all, since they have few income-related strategies like occasional jobs. Interestingly, skipping whole days without food (most severe coping strategy) is more common in urban areas and does rarely happen in periurban and rural areas. This phenomenon is explained by the fact that households in rural and periurban areas have many and sufficient coping strategies to respond to food shortages. In contrast, urban areas sometimes lack certain strategies like relying on wild plants or the sale of animals or charcoal. Hunting, reliance on prepared food, sale of animals, charcoal, firewood or handcraft and occasional employment are most frequent in the periurban area (Fig. 4). The periurban area offers enough space to raise animals and more natural growing trees for fire wood and charcoal. The periurban places are also close enough to the urban centre, where their produce can be sold and it is easy to find occasional jobs. Occasional jobs for men like masoning, block moulding, carpentry, metal working or bicycle fitting as well as the sale of traditional handcraft like woven mats were more common in periurban areas than in urban locations. Lack of job opportunity and remote location are the main reasons for occasional jobs being uncommon in rural areas. The sale of animals, charcoal and fire wood were typical source of income for periurban households as periurban places are still well connected to paved roads which facilitate trading and transportation of goods. Consumption of less preferred food, wild plants and immature crops as well as limiting portion size, adult intake and the daily number of meals are more frequent in the rural area (Fig. 4). Reliance on wild plants was more common in rural areas than in urban or periurban areas due to simple availability of edible plants. Consumption of less preferred or less expensive food was more or less equally applied in urban, periurban and rural places, although frequency in rural areas is slightly higher. As reported in Chagomoka et al. , there was strong connectivity of periurban and rural areas to the urban area as reflected, in households as far as Jimle (about 40 km east of Tamale), Pong Tamale (about 33 km north of Tamale), Tolon (about 25 km west of Tamale), Digma (about 41 km south of Tamale) and Zosali (about 54 km north of Tamale) selling most of their crops to Aboubu market in central Tamale. Women in both urban and periurban often come to provide labour in these markets in order to get money to purchase food for their families. On the other hand, some urban households were temporally migrating to periurban during the rainy season to grow crops to feed their families and return after the harvest. For example, in Suga-naa village located in the East transect about 18 km from Tamale, over 50 % residents commute to Tamale on motor bikes or bicycles 2–3 times a week, and in most cases, only husbands spend more time in growing crops, while the rest of the family is based in Tamale. Urban household also moved temporally to practise hunting and picking of fruits in both periurban and rural areas as a food coping strategy. The results from the in-depth interviews reveal that women often engage in income-generating activities to buy food for the household in times of food shortages. Some of the activities mentioned include trading with those food items that cannot be produced on the fields like salt, sugar, bread, milk powder or imported rice as well as selling of fire wood and charcoal along roadsides and day labour at the markets. For rural women and young girls, it is also typical to leave their village for a longer period to work on the big markets in Accra or Kumasi. This activity is referred to as kayayei and is generally practised for several months up to 1 year. Hence, weekly or monthly frequency could not be assessed, this is why kayayei is not listed as a coping strategy in this study. Women, in the northern region of Ghana, are expected to provide soup (relish, in the form of vegetables) which accompanies or goes with the main starchy-based meal (often from maize, sorghum or millet) usually provided by the man, referred to as landlord. Women usually do not own land to produce these vegetables; oftentimes, they are allocated land at the edges of the main crop field to produce these vegetables. Sometimes women are involved in harvesting crops as labourers in order to provide the soup for the household. Women also make use of dawadawa tree (Parkia biglobosa) and shea nut tree (Vitellaria paradoxa) to help generate income and provide nutritious soup to their families. Nevertheless, the land on which these trees grow belongs to the man and chiefs, and thus, women always have to seek permission to access them. On the other hand, occasional jobs like masoning, block moulding, carpentry, metal working or bicycle fitting as well as the sale of traditional handcraft like woven mats were more often practised by men mostly in periurban locations. In times of limited food, children and elders are always provided first. Women stated that no difference is being made between boys and girls concerning the quality and quantity of the food. When it comes for the adults to restrict themselves or forgo entire meals, pregnant and breast feeding women are favoured. The results revel that the severity of coping strategies varies along the urban–rural continuum (Fig. 6). The coping strategy of skipping a whole day without food was considered as very severe in urban, periurban and rural areas with a severity value of 4 (Fig. 6). Sending children to eat elsewhere also had the same severity value of 3 across the urban–rural continuum. On the other hand, the coping strategy of hunting varied in severity from urban to rural, with more than 1.5 in urban areas and only one in rural areas (meaning being considered as more severe in urban areas compared to rural areas). The study identified the following four strategies as least or not severe: hunting, less preferred food, small trading and occasional jobs (Fig. 7). Figure 7 also shows how the severity differed between urban, periurban and rural. For example, hunting was noted as the least severe coping strategy, more in rural areas, where it was considered to be normal and an acceptable way of reacting to food shortages, compared to urban locations. Although less preferred food was identified as not severe, it is disliked mostly by children who usually prefer tasty dishes including meat or eggs. Most preferred food included fufu (dough of yam) which is mainly consumed in the main wet season when farming households harvest their own yams. The main staple food is Tuo Zaafi (TZ) that is preferably made from maize flour but can be prepared partly or totally from cassava flour, which is less preferred. Hunting was perceived as a hobby for men although it sometimes supplies food or money from meat sales to the household. Commonly hunted animals include rabbits, grass cutters, rats, wild guinea fowl and other wild birds and sometimes big animals like antelope. All strategies ranked as least severe produce additional financial income, both directly and indirectly, and help avoid selling of animals to get food and harvesting of immature crops for consumption. Gathering wild fruits and limiting portion size per meal, rationing the available money to buy prepared food, consuming immature crops and selling of animals were identified as moderate food coping strategies (Fig. 8). The most commonly picked wild plants are the leaves and seeds of dawadawa, leaves of wild roselle (Hibiscus sabdariffa) and nuts of the shea tree. Some households were reported to collect wild honey, for own consumption as well as for sale. Shea nuts are usually mature at the beginning of the rainy season when most field crops are not yet ready to harvest. The gathering of shea nuts and processing them into shea butter and then selling is another income-generating activity mostly done by women apart from selling wood and charcoal, while men start preparing the fields. Selling of animals was mostly as a safety net in times of food shortages or other pressing household needs like school fees. 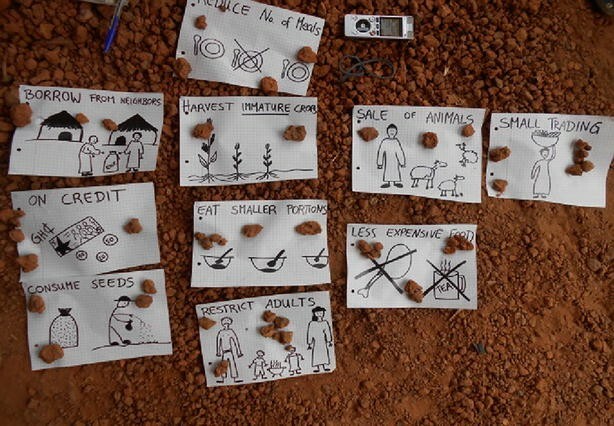 The following three coping strategies were ranked as severe by most FGD: send children to eat with neighbours, reduce the number of daily meals and sell the fire wood and charcoal (Fig. 9). Most severe coping strategies were perceived as strategies which could allow households to keep it secret that they lack food which is considered shameful and not preferred to make it public. The study identified five coping strategies as the most severe, namely skipping a whole day without food, borrowing food or money to buy food, purchasing food on credit, consuming seed stock and restricting adult intake in favour of children (Fig. 10). Some severe strategies were associated with extreme hardship as expressed with certain phrases like “the house has collapsed”, for example, when a household consumed seed stock. Some most severe strategies were applied selectively across household members, for example, skipping a whole day without food and restricting adult intake were mainly targeting adults (first men and then women) and not children. Borrowing and buying food on credit were considered to be similar as both strategies leave the household with an obligation to pay back. This situation of living on credit has been identified as a stressful scenario by households practising it. Borrowing food was also associated with shame as most households felt that asking for food from a neighbour—especially if they are not related—is a matter of exposing one’s level of poverty to other villagers. Both borrowing and buying food on credit were associated with similar risks of possibility of paying back with interest especially when you borrow or buy on credit from traders. These two coping strategies were also associated with default payments, so if borrowers die without paying back the credit, it is passed on to the living family member. Such speculation forced many households to perceive these strategies as most severe and more shameful. The coping strategy index for each location results from the multiplication of severity and frequency value (Fig. 11). The average values for each spatial area can be compared to the total average value. Table 2 provides detailed information of various coping strategies’ frequencies and coping strategy indices across the urban–rural continuum based on 19 Focus Group discussions. The results reveal that the urban CSI average was 74.3, which lies slightly below the total average of 84. The rural CSI average was 98.2, which is higher than the total average. The periurban CSI average was 80.1, which is in between urban and rural CSI averages. The CSI values in Fig. 10 show us that rural households generally were using many coping strategies compared to periurban and urban. This may be ambiguously interpreted as that the rural households were more food insecure than other location. Nevertheless, the urban households have been noted to use more of most severe coping strategy more than other location, which is another reflection of worst food insecurity situation. A closer observation of the single-location CSI values reveals a more complex picture along the continuum. The rural CSI values range from 66.5 (RE Parashe Naya) to 133.5 (RN Zosali). Periurban CSI values vary from 19.5 (PUN Pong Tamale) to 176 (PUW Dundo). In the periurban space, we find the biggest range between maximum and minimum. The urban CSI values had a minimum of 23 (UE Changli) and a maximum of 141.5 (US Junshegu). The great variability in CSI in urban and periurban was due to difference in the extent at which various areas were participating in income-generating activities (socio-spatial heterogeneity). For example, in PUN Pong Tamale and UE Changli, most participants had some jobs. There was relative similarity of CSI values in the rural, which shows that people in the rural area are in a more homogenous situation as compared to the population of the periurban and urban area. Study results reveal that food coping strategies vary from one spatial entity to another in terms of frequency, severity and coping strategy indices along the urban–rural continuum. According to Maxwell et al. (2008:534) , “more extreme behaviours, such as sales of productive assets to purchase food, hold more long-term consequences for the household”. Households tend to use severe coping strategies which represent greater food insecurity and sometimes less reversible in worsening food security situations [39, 40]. Most households would first employ coping strategies with the lowest severity and highest frequency such as eating less preferred food . The changes in the CSI shows fluctuations in household food security status, with lower CSI representing low coping and better food security situation . Although many studies have revealed the use of various food coping strategies by urban, periurban and rural populations, including the recent works of Agada and Igbokwe; Knight et al. [17, 24], less has been reported on how these strategies can vary along the urban–rural continuum. In this study, households in urban areas used more frequently severe and most severe coping strategies compared to their periurban and rural counterparts: skip whole day without eating food, borrow food or money to buy food, consume seed stock and purchase food on credit (Figs. 4, 10). Consumption of seed stock has been cited as one of the extreme cases and referred to as “the household has collapsed”. Most rural households avoided eating seed stocks as they were afraid to face the risk of not affording to buy the replacement seeds. The work of Waal  pointed out that during the famine in Sudan in the mid-1980s, seed stocks were mixed with sand by adults to prevent children from eating the seed stock. This reveals the importance of seed stock in meaningful crop production systems. Setimela et al. also confirmed the importance of seed by highlighting that “seed is an important catalyst for development of agriculture”. Frequent usage of most severe coping strategies, like skipping the whole day without eating, is associated with daring food insecurity situations . Several studies have also reported the growing scourge of food insecurity in urban areas in African cities [43–47]. Least and moderate severe strategies were frequently used in both periurban and rural areas. Gathering of wild food and selling of charcoal were common strategies in periurban and rural areas. Cruz-Garcia and Price  also pointed out that wild food is “an essential part of the diet, constituting a ‘rural safety net’ particularly for vulnerable households”. Amongst the Tonga tribe in the Southern province of Zambia, gathering and hunting were supporting traditional food security . The consumption of immature crops was also more present in periurban and rural areas than in urban (Fig. 4). The reason could be the pronounced presence of agricultural activities in periurban and rural areas more than urban areas due to high urbanization and conversion of agricultural land to residential areas. Thus, households in periurban and rural areas had the chance to target immature crops as a source of food. Sale of animals was also more implemented in periurban and rural areas, where more livestock keeping is practised (as animal keeping is officially forbidden in the urban centre by law, so cattle owners give their cattle to Fulani herders for keeping in periurban and rural areas), and production of charcoal takes place. Sales of livestock were also cited as one of the coping strategies used in Northern Ghana and Gambia by households to buy food [23, 50]. Elsewhere, the work of Verpoorten , in Rwanda, also shows the use of livestock as a coping strategy, although it does not emphasize how the frequency of this strategy varies between urban, periurban and rural. This study confirmed commonly used coping strategies, widely reported elsewhere as not severe like the consumption of less preferred food. Maxwell et al. also reported that less preferred food as a coping strategy was perceived as a low severity coping strategy in Ghana, Eritrea, Kenya, Malawi, Zambia, Zimbabwe and Ethiopia. The results show that women were engaging in income-generating activities like selling food and getting short-term employment as market women in order to get money and buy food in times of household food shortages. In Hovorka et al. , the role of women in feeding the urban population was emphasized, with women contributing to food security through activities like urban farming amongst others. Floro and Swain  reported that women from urban low-income households were engaging in food enterprises and earn money income to be used as a direct source of food for consumption. The work of Schindler  discussed the use of credits by market women and reveals that oftentimes they invest more time to nature the relationship in order to secure access to credit once shocks occur. Hope et al. highlighted that formal credit schemes are a challenge in Accra; nevertheless, vegetable sellers who are mostly women pre-finance farming activities by giving agricultural inputs like seeds. In Ghana, Awumbila and Ardayfio-Schandorf  point out that, “young girls from rural areas, particularly the northern regions move to markets in urban centres to serve as kayayei, female porters, who carry goods on their heads for a negotiated fee”. This was also found to be practised in Tamale, even if kayayei was not listed as coping strategy in this study. The study concludes that food coping strategies vary from one spatial entity to another in terms of frequency, severity and coping strategy indices along the urban–rural continuum rather than only varying from one town or country to another as reported in previous studies [12, 17, 24]. This knowledge on how households at different locations along the urban–rural continuum cope with food shortages will be useful for geographic targeting or resource allocation along the urban–urban continuum . Various coping strategies were identified and rated differently as least severe, moderate severe, severe and most severe along the urban–rural continuum. The urban households have been noted to use more of most severe coping strategies compared to periurban and rural households like borrowing food, buying food on credit and skipping the whole day without food more than periurban and rural, which is another reflection of worst food insecurity situation. Coping Strategy Index values varied along the urban–rural continuum, with rural areas having the highest average CSI compared to periurban and rural. Nevertheless, a closer observation of the single-location CSI values reveals a more complex picture along the continuum, with varying CSI values within the same location. There was relative similarity of CSI values in the rural, which shows that people in the rural area are in a more homogenous situation as compared to the population of the periurban and urban area. Women in the study area participated in coping strategies which helped in providing food in many households, like trading items, shea butter processing and other handcraft. We recommend further support by respective institutions such as microfinance in providing financial means to start small business and establish trading cooperatives as a contribution to food security in northern Ghana. Success was reported in Ghana and South Africa following microfinance interventions in terms of increased business incomes, improved access to life-enhancing facilities and empowerment of people, particularly women . The microfinance innovations may take the form of loans and savings as discussed by Dary and Haruna . We acknowledge that this study only focused on one of the three regions of northern Ghana mostly affected by hunger and poverty. We recommend future studies to look at all the three northern regions of Ghana (upper west, upper east and northern) using the urban–rural approach and summarize the coping strategies employed by the households across these regions. Central Gonja, East Gonja, Mion, Sagnarigu, Savelugu-Nanton, Tamale Metropolitan and Tolon. TC designed the research, developed data collection tools, and participated in data analysis and drafting the manuscript. SU collected the data, and participated in data analysis and writing the paper. AD, RG, BM and JS contributed in designing the research and writing the paper. All authors read and approved the final manuscript. Mr. Takemore Chagomoka is a PhD student at University of Freiburg. His research interests include urban and periurban agriculture in developing countries; Geographic Information Systems (GIS); Socio-spatial dynamics of food and nutritional security in sub-Sahara Africa. He has worked extensively in the sector of agriculture in sub-Sahara Africa in many countries including Zimbabwe, Mozambique, Tanzania and Cameroon. His current PhD research focuses on Food and Nutrition Insecurity Risk Mapping (FNIRM) in urban and periurban areas of West Africa cities (Tamale and Ouagadougou). Ms. Sophie Unger completed her Master at the Institute of Physical Geography at University of Freiburg. Her research focus is on food insecurity and coping strategies in Tamale, Ghana. She has further worked on urban agriculture and community gardening in Bangkok, Thailand. She received her BA degree in Political Science and Ethnology at Heidelberg University. Dr. Axel Drescher is a Professor of Applied Geography of the Tropics and Subtropics. He is the head of the working group “Development Geography” at University of Freiburg. His research interests include Water and Land Resource Management; Application of Geographic Information Systems (GIS) and Remote Sensing in Development Research and Project Management, Urban and Periurban agriculture with main focus on small scale production systems (home gardens, school gardens, allotment gardens, Food Security and livelihood analysis in Africa and Asia). Dr. Rüdiger Glaser is a full Professor and Managing Director of the Institute for Physical Geography at University of Freiburg. His research interests include Climate change, Global change, Geocommunication, Collaborative research environments and Food Security in Central Europe, North America and selected locations of global change. Dr. Bernd Marschner is a full Professor for Soil Science/Soil Ecology at Institute of Geography, Ruhr-University Bochum. His research interests include soil microbial and enzyme activity, soil organic matter stability, soil contamination, soil amendments for improving soil fertility, and food security. Dr. Johannes Schlesinger is a Postdoctoral Scientist under the UrbanFoodPlus at University of Freiburg. His research interests include spatio-temporal dynamics of crop production patterns along the urban–rural continuum, food security and geographic information systems (GIS) in west and east Africa. This paper is part of PhD work of the first author and Master thesis of the second author. This study was funded by Federal Ministry of Education and Research (BMBF) under the project UrbanFoodPlus, German Federal Enterprise for International Cooperation (GIZ) and Rosa Luxemburg Foundation. We thank the community leaders in the surveyed area for their cooperation during the data collection. The authors wish to thank all those who participated in the Focus Group discussions and in-depth interviews. We thank the field assistants for their dedication during this study. Written informed consent was obtained from the participant for publication of their individual details and accompanying images in this manuscript. The consent form is held by the authors and is available for review by the Editor-in-Chief. The article processing charge was funded by the German Research Foundation (DFG) and the Albert Ludwigs University Freiburg in the funding programme Open Access Publishing. Drechsel P, Graefe S, Sonou M, Cofie OO. Informal irrigation in urban West Africa: An overview. International Water Management Institute 2006;IWMI Research Report 102. Available from: Available on http://www.ruaf.org/sites/default/files/Drechsel.pdf. Quaye W. Food security situation in northern Ghana, coping strategies and related constraints. Afr J Agr Res. 2008;3:334–42. Available from: http://www.academicjournals.org/AJAR.